Back in May, I discovered what I was sure were morel mushrooms in my backyard. I spent two days photographing them, researching them, examining them, and asking everyone on the Internet whether they were indeed morels or false morels. In the end, I left the potentially scrumptious mushrooms to rot because I wasn't quite sure. It got me thinking, though. What if I grew mushrooms in my own backyard? Why not! I've got everything else growing here. Why not mushrooms that I'm not afraid to eat? 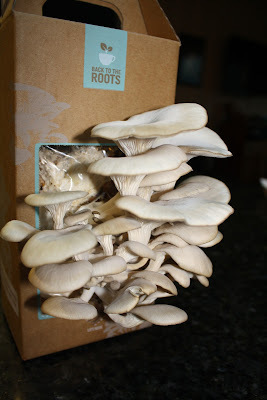 I started researching and, coincidentally, Northwest Edible Life posted a giveaway for a Back to the Roots Oyster Mushroom Kit. A what? Turns out it was a groovy little cardboard box stuffed with recycled Peet's Coffee coffee grounds (Hellllo, ultimate reuse! Love it!) and mushroom spores. All you have to do is soak the plastic bag of grounds and baby mushrooms in water for 24 hours and then mist it twice a day with the provided mister and, ta da! Mushrooms grown in your own property that are safe to eat! I entered the giveaway all three times and promptly forgot about winning anything. A couple days later, shopping at Whole Foods, I spotted the mushroom kit and tossed it in the cart. I mean, I wasn't winning any giveaways but that looked like a really cool kit! I get home, check my fav blogs and low and behold, I won it! Now I've got two mushroom kits. Score! How were they? Very very cool and as easy as can be. The shrooms grew by leaps and bounds. Every morning the kids would ooh and ahh and, frankly, I did too! Plus, are they grew the looked like some sort of really cool modern art structure. I harvested them about 10 days after I started the whole process. We devoured them shortly after in my favorite mushroom recipe - summer soup - and I promptly soaked them again so we can harvest from the other side. Pizza next time! 1) Like BTTR on their Facebook page and leave a comment here letting me know. If you already "like" them, cool. Just leave a comment. 2) Follow BTTR on Twitter and leave a comment here, reporting in. 3) Visit BTTR's website and then leave a comment here indicating something that you learned about mushrooms or their company. *BTW, post a photo of your grown mushroom kit on their Facebook page and BTTR will send a sustainability curriculum and donate a kit to an elementary school of your choice! * Disclosure: I purchased a kit with my own money and won a kit from another blog. I offered to do a giveaway for their product and reviewed my kit as part of the giveaway. I've not received anything other than the kit I won from BTTR. "liked" on FB...Great review! A mushroom kit is one thing that has been on my want-to-try list for quite a long time! *followed on twitter, too! Love the idea of reusing coffee grounds. OK I love the fact they reuse coffee grounds with this. And that they donate to schools! This would be great - have wanted to do for a long time. What a fantastic idea! I think my 2 year old and myself would have fun growing mushrooms! It is nice to know that all those coffee grounds are going to good use too! Visited their website and impressed they are on track to reuse 1 million pounds of coffee grounds. I visited the BTTR website, and I can't believe how easy it is to grow mushrooms! And I love that the growing medium is 100% recycled. I would love to win and kit, and think my kids would love watching them grow, especially since it only takes 10 days to harvest. Oh this is just an awesome idea!! I think it would be so much fun to grow your own mushrooms!! Visited the website and learned that they are on track to divert 1 million pounds of coffee grounds from the dump! Awesome way to reuse. "liked" on FB. would love to win. Thanks for the giveaway. I'm really impressed with their commitment to sustainability, but also to creating local jobs as well. This is the kind of company I can get behind. I want to make the tofu-asparagus-mushroom recipe but asparagus is done in my garden and I have an abundance of green beans. So will substitute. I would love to win a kit. I have to rewatch the video at home...my work computer does not have speakers so I couldn't really follow the interview they were giving. Checked out their website. I did not know you could grow mushrooms in used coffee grounds. Very cool. liked on FB- What an awesome kit! I liked them on FB when NWE had her giveaway!! Visited the site...they are trying to divert over 1 million lbs of coffee grounds from landfills...how awesome! i've just clicked to follow them on twitter. and now i've "liked" them on fb. wow, very cool that they plan to recycle a millions pounds of coffee grounds this year! I like BTTR on Facebook... and I would love to win one of their kits. Just clicked "like" on facebook...how cool for teaching kids (and ourselves) about mushrooms and other great growing things! I liked on FB and just followed on Twitter! I hope I win, I'd love to share the mushroom growing with my cousin! I learned that the kits grow up to 1 1/2 lbs of oyster mushrooms in about 10 days on recycled coffee grounds. Liked on comment and following on twitter too! 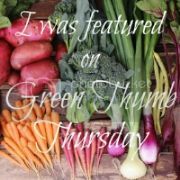 I like BTTR on Facebook (Cheryl HeartnSoulmom). I follow BTTR on Twitter @HeartnSoulmom. And the Mushroom King or Queen Is . . . Cooking when it's too hot to cook? There Is More Than One Way to Skin A . . .
Time to Start Planning for Christmas?